Hi, my name is Shiray, I'm 13 years old and I'm from Malaysia. Last year, I saw a lot of posts on Facebook about dolphin hunting. I was really curious, so I searched for info about it and I learnt a lot about what happens to dolphins in Taiji, Japan. Then I came across a movie entitled The Cove, which also tells the story of dolphins in Taiji. It was the most heartbreaking movie I have ever watched. That sparked my urge to know more about it. So I started to do research on dolphins in captivity. After some intensive research and countless tears shed, I went on to write a story about a captive dolphin named Angel. I have loved storytelling since I was a child and I believed I could capture the attention of an audience to raise awareness of the dolphin killings and captivity through telling the story. My school teacher invited me to present the story to my classmates and some of them cried. Some of them had supported dolphin shows before, but said they would never ever go to watch a dolphin show again. My teacher said the story was very touching and that he and his family would never go to a dolphin show again either. In July 2015 I was invited by Suzette Ackermann, an independent animal activist, to present my story at a show in Hong Kong. I hoped the audience, including the children, would remember my story for the rest of their lives, so that they would never visit a marine park ever again. I did get a great reception but I really don't need audiences telling me my speech was amazing, all I want to hear is, "Listening to your story has changed me. I have made my pledge and I will never visit a marine park again." Most of us assume dolphins have beautiful smiles because they are happy. But I want to tell everybody that the dolphin's smile is the biggest illusion on earth. A lot of people don't know that it is not really a smile. Dolphins will have that same "smile" even when they suffer from depression or pain, and even when they face imminent death. That beautiful and deceptive "smile" has caused them a lot of problems. Because of the cute smile, people fall in love with dolphins. They want to get close to them, to touch them, kiss them, to swim with them – some even decide to become dolphin trainers. 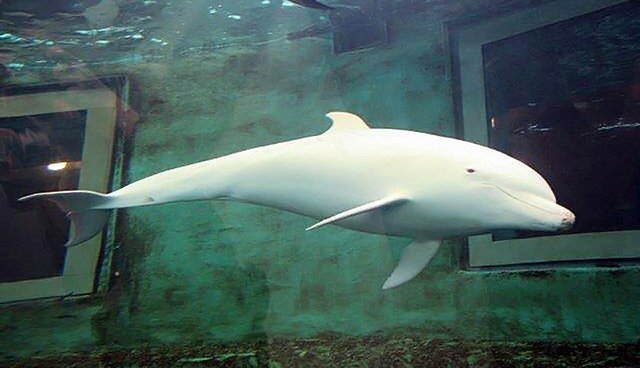 The demand for captive dolphins could be stemmed but for misperceptions of this beautiful smile. During my research, I even came across some people who shared such astonishing opinions as that dolphins in captivity are very lucky because they have shelter and free food so they do not have to hunt for food. So I am here to tell you about dolphins in captivity. It's a truly sad story that is happening around the world as I speak. 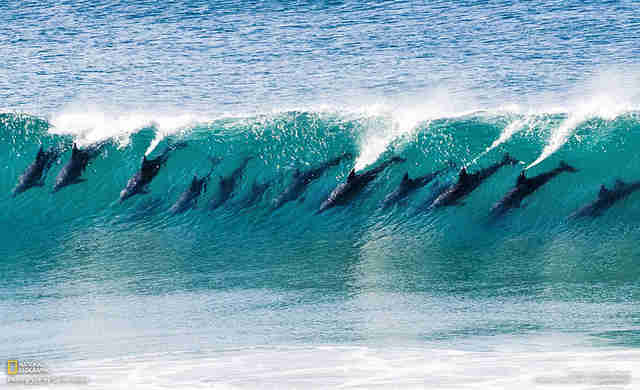 Wild dolphins live freely in the ocean and surf the waves. They are natural born surfers, the best in the world! Some of them have devised the use of sea sponges as beak protectors during hunting. They often play – they toss seaweed amongst them just like we play catch the ball! They play chase and catch. They leap out of the water. They have even been observed creating and playing with air bubble rings. They are just like humans – doing all these things as a community. They are social creatures that live in groups from two up to a few hundred members. In Taiji local fishermen hunt dolphins annually from September till March. When they spot dolphins, they bang steel pipes with mallets to create high pitched sounds to scare and confuse them. Then they herd the confused and scared dolphins into a shallow cove and trap them there with nets. This is where the violent acts of capture and killing happen. 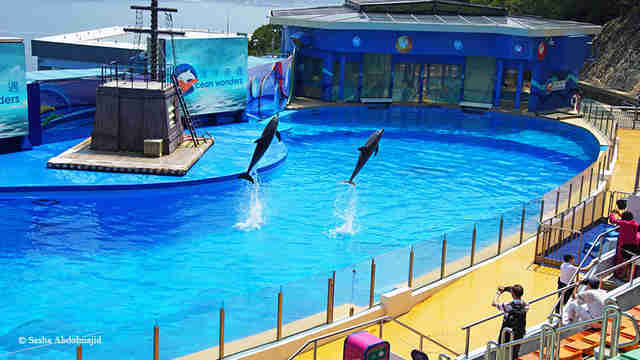 First, they invite dolphin trainers to choose the most handsome dolphins to sell to marine parks worldwide. The other members that are left behind then face the most tragic moments of their lives. Fishermen insert a sharp metal rod into the dolphin's spinal cord, allowing the blood to spurt out. The water of the cove turns red with their blood, and the air becomes heavy with the smell of it. The dolphins whistle, shiver and tremble in pain to their death. The saddest thing is that they are forced to watch as their calves are forcefully taken away from them, and also as their own family members are tortured and killed, well aware that they are going to be next. These dolphins will be sold for large amounts of money to marine parks around the world, where they will begin their horrible lives as 'performers'. They will live surrounded by walls, in small concrete tanks filled with chlorine and medicated water. They will be forced to eat dead fish and trained to perform all kinds of unnatural crazy tricks for the audience, all for profit. If you pay enough attention during the show, the dolphins' eyes are always on the bucket of fish. That is because they are being deprived of food until they perform the right trick. "You do as I tell you, then you will get your food" kind of thing. That's how they are forced to "work", not because they love to do all the boring and repetitive tricks, but because they are hungry and they need to eat. Let me remind you again, the dolphins are not smiling during the performance, instead they are suffering, stressed and calling for your help! We must understand that dolphins are highly intelligent mammals like humans, they also have feelings and complex emotions like us. They behave like humans! They have their own way to communicate. They each have unique names and call each other by these via distinctive whistles. They are self-aware as they can recognise themselves in mirrors; they can differentiate adults, kids or a pregnant lady. They learn to use tools to hunt for fish and, more surprisingly, they mourn for their loved ones. We can't deny the existence of their complex emotions and stress just because we can't understand their language. If humans could understand their language, we might be able to hear their pleas in the marine parks – "Please tell me why? What did I do wrong to deserve all this? Why did you take me away from my family? I miss them! I miss the ocean! I want to surf in the ocean! I want to play with my family! I hate the chlorine that irritates my eyes! I hate the tank! It is too small! I have no friends here! I am lonely... please let me go! Please let me go back to the ocean! Please set me free." All these dolphins in small tanks have shorter than average life spans when compared to in the wild. Why? That is because they are depressed and stressed. They often suffer from physical illnesses and psychological problems that need them to be treated with antibiotics and steroids to look well and appear normal for the show. Some of these poor creatures even commit suicide and end their lives just to be free from the torture they can no longer endure. I once watched a video about a dolphin in captivity that was kept in a very small tank and who tried to commit suicide by jumping out of the tank onto the platform, knowing that once the water on its skin evaporated and dried, it would then die slowly. This poor dolphin tried over and over again to land on the platform but failed because it was too slippery. I also learned that a few captive dolphins – like Peter, Kathy and many others – committed suicide or tried to, by jumping out of their tanks, stopping breathing, stopping eating or repeatedly banging their heads against the wall. For these highly intelligent creatures, living their lives as slaves had become so unbearable that suicide was the only way to be free. To all the trainers out there, can I ask you a question? 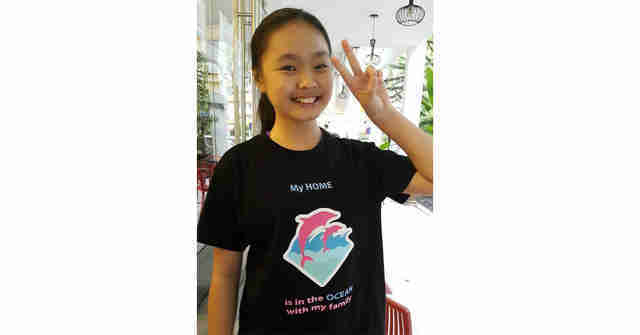 Do you love dolphins? If you say yes, how can you capture them from their home in the ocean with your bare hands and rip them apart from their families and loved ones, and put them in jail, in a tiny concrete tank, for the pleasure and benefit of humans, making them into slaves of humans? That isn't love, that's called torture and abuse, and it is cruel. If you love dolphins, give them a chance, a chance to be in the ocean, where they belong! We all know deep inside our hearts, that we really want future generations to have a chance to see them in the wild and become friends with them. So please stop buying tickets to watch dolphin shows. If no-one wants to watch the shows, and no-one wants to see dolphins in marine parks, they won't capture any more dolphins and hence there will not be any more killing. And please return all the dolphins to the wild as they deserve to live their lives free, as it should be. As Jacques Cousteau once said, When we return wild animals to nature, we merely return them to what is already theirs. For men cannot give wild animals freedom, they can only take it away. So, together we stand up and SAY NO TO DOLPHINS IN CAPTIVITY! They are meant to be in the ocean! Special thanks to Gaye Hunter and Sasha Abdolmajid for their editing support, and to Suzette Ackermann for inviting me to Hong Kong! Please note the whole content was written by Shiray herself without influence. Ceta Journal is of the opinion that it is our responsibility to encourage and support the younger generation for a better future, their future. It was a pleasure for us to give Shiray the opportunity to express her concerns. This article is also available in French, Spanish and Japanese. This Work is authorized to be published by ceta-journal.net/">Ceta Journal exclusively by the author. If any individual, organization, or media wants to share the Work, it shall share the original link on ceta-journal.net and acknowledge the author by name and ceta-journal.net.